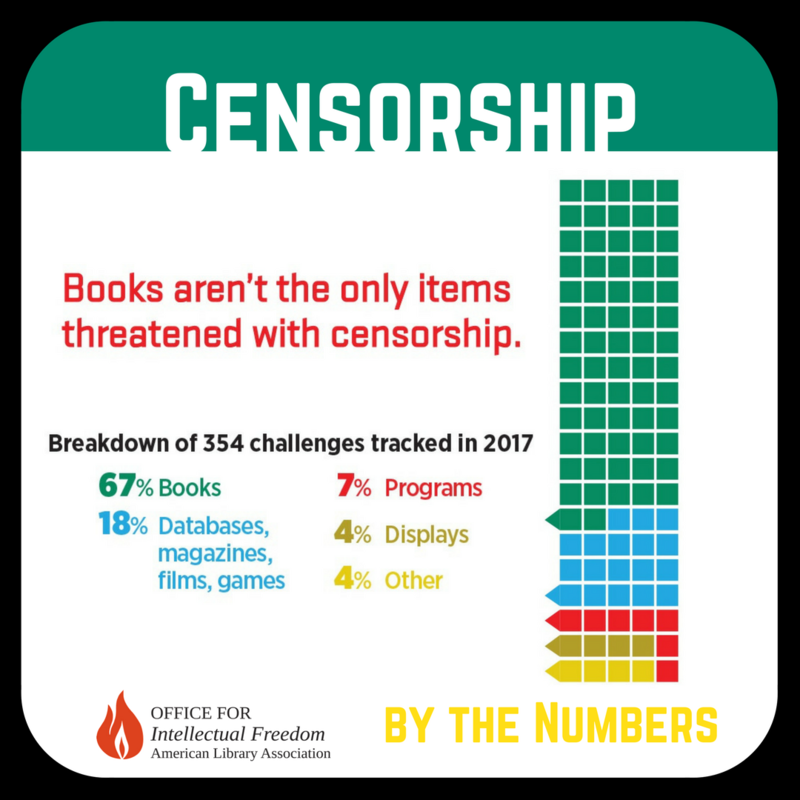 This week American Library Association‘s Office for Intellectual Freedom released its 2017 Most Challenged Books list, comprised of challenges reported to them as well as those discovered by local and national news coverage. However, of the 354 challenges in 2017, only 67% were actually about specific books. The rest of the challenges were to games, films, events, displays, etc. These challenges still can, and often do, lead to censorship that infringes on citizens’ First Amendment rights. Seven percent of the challenges were for programs, like the one at New Triers High School outside of Chicago where a few parents tried to get an event with Award-winning authors Andrew Aydin (MARCH) and Colson Whitehead (The Underground Railroad) canceled. The event was an annual seminar day for the entire school with that year’s theme of “Understanding Today’s Struggle for Racial Civil Rights.” The dissent stemmed from a belief that the speakers and workshops were liberal, and only espoused a singular viewpoint, without the proper counterbalance of conservative speakers to offer another. They never specified what alternative viewpoint to civil rights they wanted to be offered to the students, which could be a reason that their challenge, despite gaining a lot of media attention, didn’t have a lot of local support. The notion that this day somehow advances an agenda or point of view is just not borne out by the goals and structure of the sessions. Where appropriate, topics will be covered from multiple perspectives. However, we are not going to, for example, question the very existence of racism in furtherance of some extreme notion of balance. In the end, the majority of parents and students won out against the small but vocal group of opposition. Andrew Aydin and Colson Whitehead spoke to the students. The news media covered that justice prevailed and both sides congratulated themselves that all points of view were heard in a sane and civic-minded manner. So why cover it a year later when discussing the challenges made to programs and events? Because following last year’s seminar day, New Triers has canceled the annual conference. It is easier to not hold it, regardless of topic, than to deal with the media attention, irate parents, and defamation of their nationally recognized academic program. So the outspoken minority dictated the education standards for the majority, and the students lost out on a wonderful learning opportunity. There’s no census to see the students who would have been inspired to change the world based on a seminar that never happened. There’s no way to count the number of people who won’t read a book because it wasn’t allowed to be displayed. 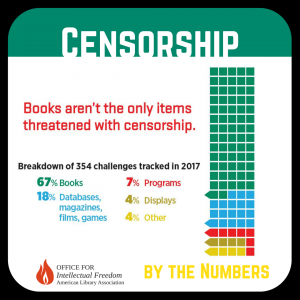 The challenges American Library Association’s Office for Intellectual Freedom tracks aren’t just numbers. Each one is a story filled with people who are affected by censorship. That’s why reporting these challenges when they happen is critical to true intellectual freedom.